Adult common bottlenose dolphins can be 1.9-3.8m long, and weigh between 250-600kg. Females are usually smaller and slender than males. Newborns are about 1-1.3m in length with 15-20kg. There are 20-26 pairs of large, pointed teeth in the upper jaw and 18-24 pairs in the lower jaw. Life span is, at least, 50 years for females, and 40-45years for males. Bottlenose dolphins have a wide head; a large, robust body, a short robust beak, long flippers, and a moderately tall, falcate, centrally placed dorsal fin. It has a marked crease between the melon and the beak. There are morphological differences between the inshore and the offshore forms of bottlenose dolphins. The colour pattern consists mostly of grey tones, with strong countershading (dark dorsally and light ventrally), but without a sharp differentiation between back and abdomen. Ventral side can be white on some populations. Tooth scratches or scars are often present on various parts of the body, especially the dorsal fins, making them unique and allowing individual recognition. 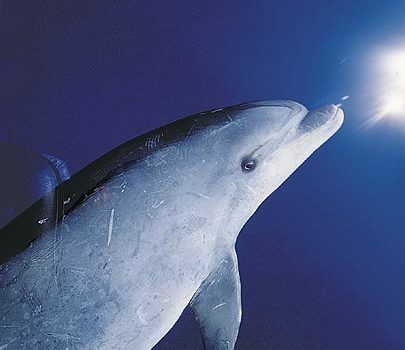 The bottlenose dolphins have one of the most diverse diets of all cetaceans. They prey on a large variety of organisms, depending on the habitat. They can feed on bottom or pelagic, small or large fish; squid and other cephalopods; and, shrimp and other crustaceans. Group sizes vary greatly in size from less than 20 individuals to several hundreds, depending partially on habitat. Composition and stability of these groups also change with time. Some individuals are even known to be solitary, but it is also frequent for bottlenose dolphins to associate with other species. In the Azores they relate frequently with short-finned pilot whales (Globicephala macrorhynchus) and false killer whales (Pseudorca crassidens). Gestation lasts about a year. Calves can be born at any season. Lactation lasts 1-2years, and the average calving interval is three years. 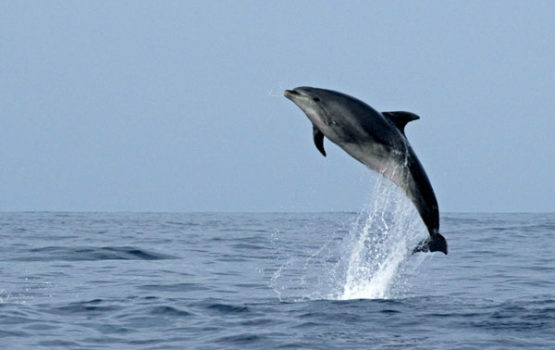 Hybrids between bottlenose dolphins and other dolphin species have been described both for captivity and in the wild. They can be indifferent to fast-moving boats, but often they approach and bowride the waves. Contrary to the friendly image that was passed to us by the television show that made this, the most familiar dolphins species to everyone, “Flipper”; these dolphins are often responsible for acting aggressively toward and killing other cetaceans, especially short-beaked common dolphins (Delphinus delphis) and Harbour porpoises (Phocoena phocoena). Bottlenose dolphins are a widely distributed species that occurs in tropical and temperate waters. It occupies a wide variety of habitats: costal and shallow to offshore and deep environments; they are even known to reside in some bays, estuaries and lower reaches of rivers. 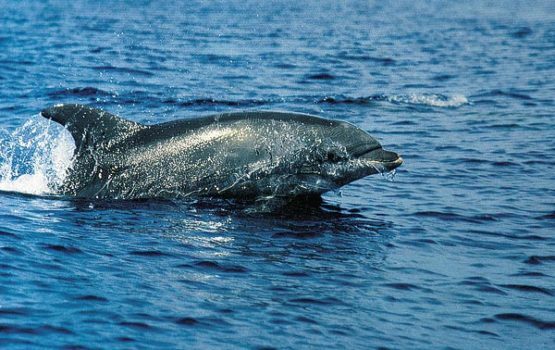 They can be confused with rough-toothed dolphins (Steno bredanensis), Risso’s dolphins (Grampus griseus), and Atlantic spotted dolphins (Stenella frontalis) at a distance. On a closer look, the rough-toothed dolphins are smaller in size and lack a definite crease between the melon and beak. Although the dorsal fin and general size of Risso’s dolphins can be similar to that of bottlenose dolphins, their distinct head shape and scarred pigmentation pattern allows the recognition between the two species. 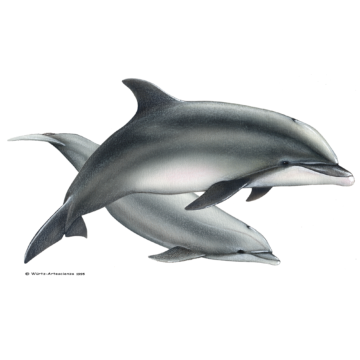 Spotted dolphins, especially when not heavily spotted, can be distinguished due to their smaller size and slimmer bodies and beaks, as well as stronger pigmentation features. Bottlenose dolphins are one of the resident species of dolphins in the Azores. They are present more or less constantly throughout the season. Although there are annual variations in the frequency and abundance of this species, they are present on average in 35% of our trips.